While home delivery remains the preferred method for grocery fulfillment, click and collect is rapidly gaining popularity - especially among millennials, who are a leading indicator for coming trends. In 2018, Nielsen Homescan data reported that about 40% of consumers used click and collect, compared to 33% during the 2015 holiday season (and compared to 72% in the UK). The number of grocers offering click and collect grew from 15% to 23% in 2016, showing a 53% growth. OC&C Strategy Consultants predicts that by 2025, "10% of all sales will be fulfilled by click and collect. In-store purchases will decline to 60%." Click and collect – also known as BOPUS or BOPIS (Buy Online, Pick Up In-Store) – is becoming a new norm, which means grocers who aren't offering it yet need to catch up. But what makes this hybrid form of shopping so appealing? First, it saves time. According to a 2018 report from Barilliance, 88% of respondents said they used click and collect because of speed. Forbes writes that "micro-shopping trips" (any trip that takes less than five minutes) are on the rise "thanks to grocery services that let customers order online and pick up in-store." Micro-shopping trips increased by 8.7% at Whole Foods stores, and 11% at Whole Foods stores with dedicated pick-up locations, after Amazon acquired the chain in August 2017, according to InMarket. Second, click and collect helps customers save on shipping costs. In the same Barilliance report cited above, saving on shipping costs was customers' second most popular reason for choosing click and collect, (with 76% of respondents noting it). Third, it allows customers to maintain control over what they purchase, because they can inspect the product before paying for it. This is a common concern for online purchases of perishable goods such as produce and meat. Affirming this, Nielsen Homescan Data found that "the typical click and collect shopping basket is heavy on edibles like meat, produce, dairy and frozen foods." Click and collect isn't just good for shoppers; it's great for business. Cybertill, a leading cloud-based software innovator, found that 65% of shoppers make additional purchases in-store when picking up their online order. Grocers who offer click and collect have seen a 30%-50% spike in sales across all channels versus traditional shopping, according to a report from Grocery Manufacturers Association and The Boston Consulting Group. Click and collect also solves issues around cart abandonment, which is a major barrier to online shopping. According to Barilliance, shoppers frequently abandon their online cart before purchasing because they find out too late about unexpected shipping costs, lack of express shipping, and an unfavorable return policy – all of which are easily circumvented in click and collect. But it's not just about numbers. Click and collect is an integral part of the omnichannel customer experience – allowing customers more freedom, more options, and fewer barriers to fulfillment. "More important [than numbers]," write Forbes, "89% of those who use it are satisfied with the experience, largely because of the convenience." Where is click and collect already happening? Since 2017, Walmart has installed over 700 "Pickup Towers," or kiosks where shoppers pick up their online orders. According to the store's blog, Towers are now available to over 40% of Americans, and they have gotten an "overwhelmingly positive" response. In 2018's first quarter, Kroger reported that online sale rose 66% - and credited the change to ClickList, its version of click and collect. Target now offers a Drive-Up Service, wherein customers don't even have to leave their cars to receive their orders. Shoppers can order online, drive to the store, and wait in designated parking spots for a store team member to deliver their order. Like Walmart and its Towers, Amazon has installed more than 2,800 Amazon Lockers in 70+ metropolitan locations across the U.S., in Whole Foods as well as in convenience stores. These lockers allow shoppers to choose a delivery location other than their home or office, giving them more flexibility with pick-up after ordering on Amazon. Even Instacart, the house hold name for grocery home delivery, has expanded into click and collect with their latest Pickup service now available in roughly 200 stores. Smaller chains face their own challenges in implementing click and collect. 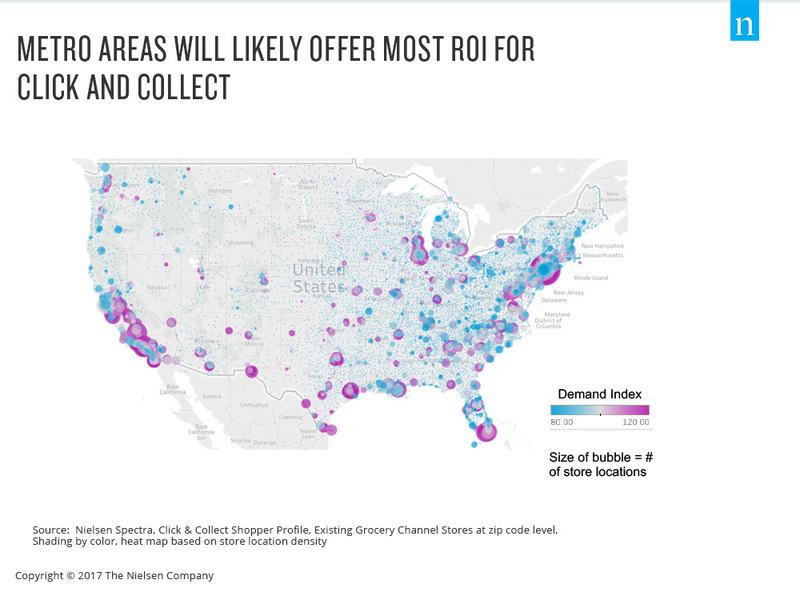 For many stores, space is an issue, because click and collect requires a dedicated pick-up location that is both clear and conveniently accessible to customers. This channel is also more labor-intensive for grocers than in-store shopping, because it requires store associates to pack and manage the orders. Though the in-store implementation of click and collect might prove difficult, it's nothing compared to the digital side. Grocers will need sophisticated software that creates a seamless, customizable, and comprehensive customer experience; keeps accurate, real-time inventory; faithfully reflects the store's brand; and offers competitive services such as personalization, meal-planning and data intelligence. This can be an insurmountable challenge without hiring an expert SaaS (software-as-a-service) third party such as locai. To learn more about how we can help your business implement click and collect and other necessary e-grocery services, click here.